If you are a boater or a regular beach visitor along the Florida coast of the USA there’s now an easy way to help aid a stranded or injured dolphin or whale. NOAA Fisheries is offering a new smartphone app that can be used to alert officials about a stranded sea creature. 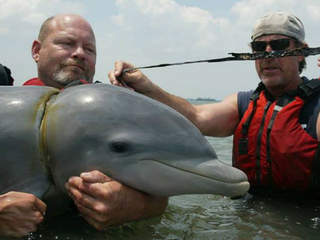 “Dolphin & Whale 911” enables residents in the southeastern US to immediately report live or dead stranded, injured or entangled marine mammals by connecting them to the nearest stranding response hotline, detected through your phone’s internal GPS system.